Every trip I make to Calgary is an "eat-cation." 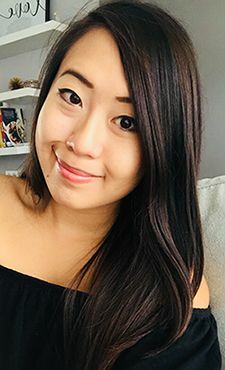 It just seems like there's a bounty of restaurants that get rave reviews, so I try to fit in as many meals as possible every time I'm down there. A while back I was in town with some family and we decided to check out Carino as I had heard some good things about their ramen! 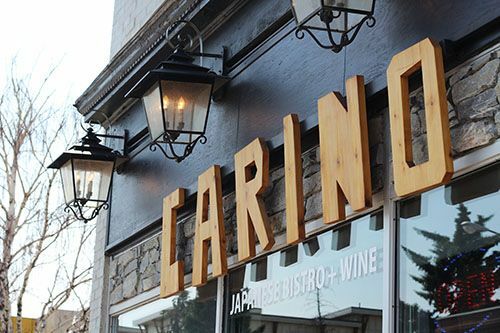 Located within close proximity to other popular eateries, Carino is a little different from the rest. The small space is decorated with mirrors and black chandeliers, giving it an upscale, modern feel. On the menu there's French and Italian twists on traditional Japanese dishes so it was hard for us to decide what we wanted to try. 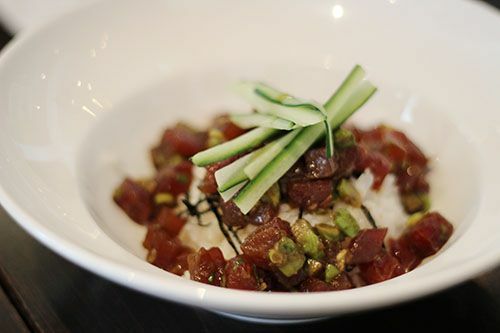 We ended up starting with the Ahi Poki Rice Bowl ($14) with marinated ahi tuna, shallots, sesame oil, green onion and avocado. The fish was fresh and the aroma of the sesame oil was the predominant flavour of this dish. The avocado gave it a creamy texture, and I like that the rice had been mixed with some rice vinegar to give the dish some tangy notes. I just wish there was a greater portion of tuna! 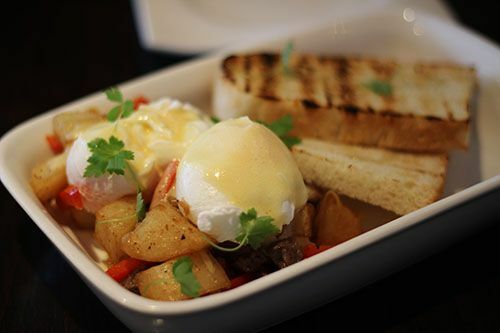 Next up was the FSM Hash ($11.95): 2 poached eggs, yuzu hollandaise, corn, onions, peppers, chorizo sausage, pork belly, beef, and garlic potato hash with grilled focaccia. It was your typical Sunday morning brunch with a little twist. The eggs were poached perfectly and the hollandaise the right consistency. The potatoes were well seasoned making the hash very tasty, but aside from the different hollandaise I didn't find this dish to be too special. 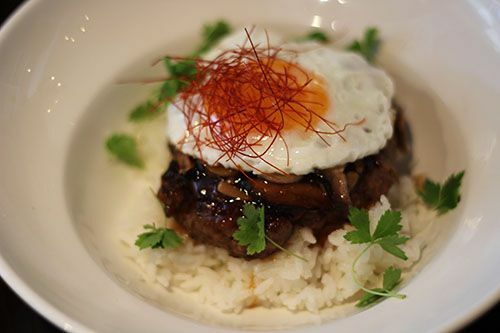 Our next dish was the Loco Moco ($14) which featured a wagyu beef patty over rice, teriyaki sauce, mushrooms and a sunny side up egg. The wagyu patty was cooked to have some pink on the inside, but it was tender and juicy. We broke it up and mixed it with the sauce, egg and rice to make a delicious mish mash of sorts. The yolk kept everything together and it was a pretty filling dish. The Mentaiko Pasta ($14.95) was surprisingly one of my favourite dishes at the table. Spaghetti was mixed together with pollack roe, baby scallops, prawns, shiso leaf & seaweed. I love tobiko (flying fish roe) but had never tried pollack roe and quite enjoyed it. This pink roe is miniscule and adds an unexpected crunch and briny flavour to the al dente pasta. There was a nice portion of seafood in the dish but the roe is what made me love this dish the most. Last but not least was the ramen I had been waiting for. We chose to go with the Miso Ramen ($13.50) which consisted of a miso broth with BBQ pork, bean sprouts, cabbage, corn, bamboo shoots, a boiled egg & wakame. The pork was flavourful and tender and the noodles were al dente. 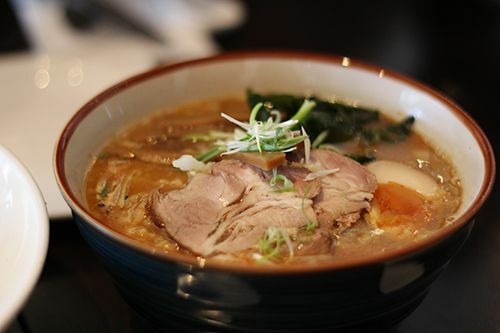 The miso flavour was prominent and the broth had a nice depth of flavour. Not the most amazing ramen I've ever had, but pretty good for Alberta standards. 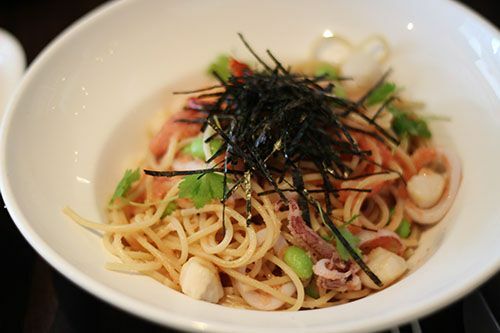 Who would have thought that Japanese and Italian cuisine could mix together? I definitely didn't, but Carino is here to show that it can be done and executed well. It is a little pricier, but the intimate atmosphere is perfect for a dinner date or celebratory dinner. OMG, that ahi tuna bowl and the ramen look sooo delicious! Everything looks great though I'd totally want to join you for the food! I've never tried that fusion of cuisines before but it looks good! OmG! So ebautiful and delicious pics! Coffee Break: District Coffee Co.